The more I cook, the more I appreciate ingredients and flavors that are uncomplicated. In fact, it’s usually the simplest recipes that are the most delicious and impressive, so simple salads have been kind of my jam lately. 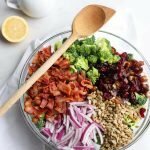 This BROCCOLI AND BACON SALAD with a creamy lemon garlic dressing is definitely simple and super flavorful, too! And it hits AAALLLLL the crave worth points, combining something sweet, something salty and something crunchy. I’m planning to make it next week as a side for Thanksgiving, but I like to make it in the summertime at picnics or bbqs, too. Whole30 compliant bacon was pretty elusive in the past. Just a few years ago, it was pretty much impossible to find bacon made with sugar or sweeteners! 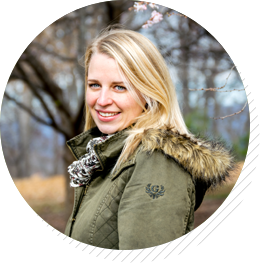 One of the coolest thing I’ve gotten to see as Whole30 and clean eating trends take hold is an increase in the availability of compliant products. It’s still kind of a specialty item, but Whole30 compliant bacon is out there! And my favorite Whole30 compliant bacon is Naked Bacon. It’s really, really, unbelievably delicious. HIGHLY recommend. You know I’m always into make-ahead meals, and this is no exception. 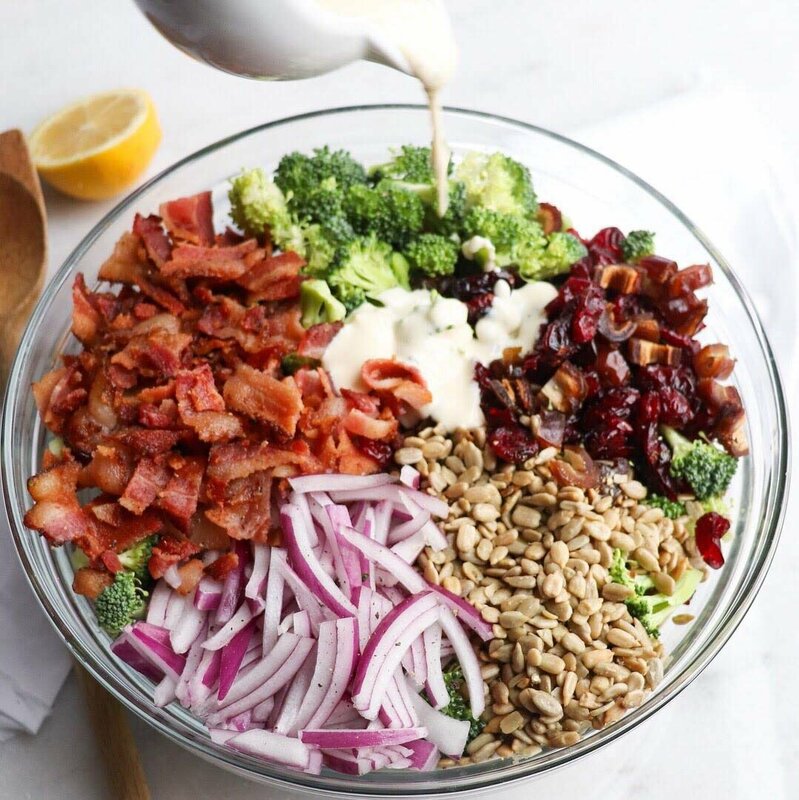 You can definitely prepare the Broccoli & Bacon salad in advance, but be sure to wait until just before serving to toss with the dressing. **KETO / LOW CARB option: Omit the dates and cranberries. You can substitute fresh or dried blueberries if you’d like or just leave them off the salad completely. **VEGETARIAN option: Simply omit the bacon and substitute vegetarian mayo. You can include mushroom or coconut bacon, if you’d like, or just leave it out completely. Either way will be totally delish! This is one of my favorite recipes for parties and cookouts. It’s nice and crunchy, and it hits all the salty, sweet flavor points. Grate or finely mince the garlic, then whisk together all ingredients in a small bowl. Season with salt and pepper to taste, adding a touch more lemon juice to thin to desired consistency, if needed. Remove the stems from the broccoli and chop into bite sized pieces. Thinly slice the red onion and roughly chop any larger pieces of dried fruit. Just before serving, mix all salad ingredients together and toss with dressing. 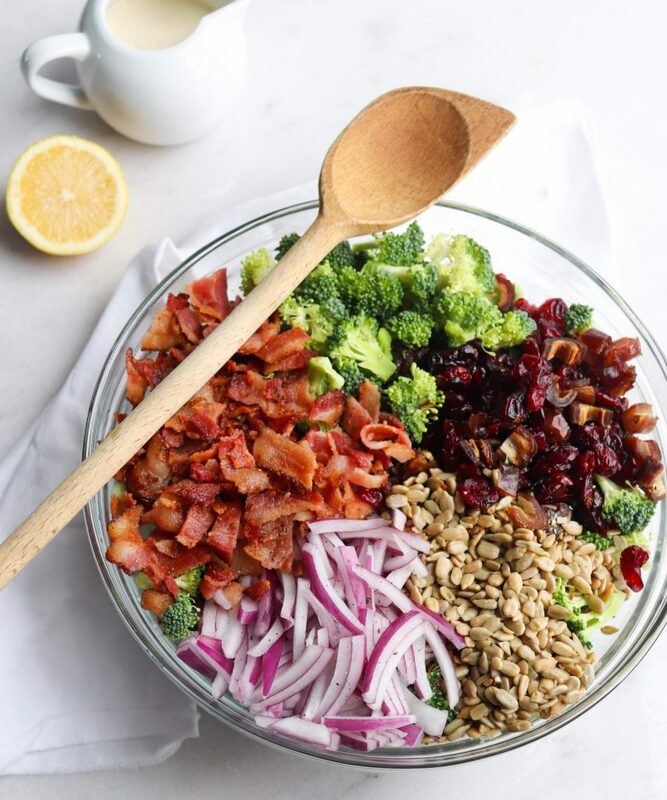 I prefer raw broccoli in this salad, but but feel free to lightly blanch the broccoli if that’s better for you. Cook for about 1 minute, or just until bright green. 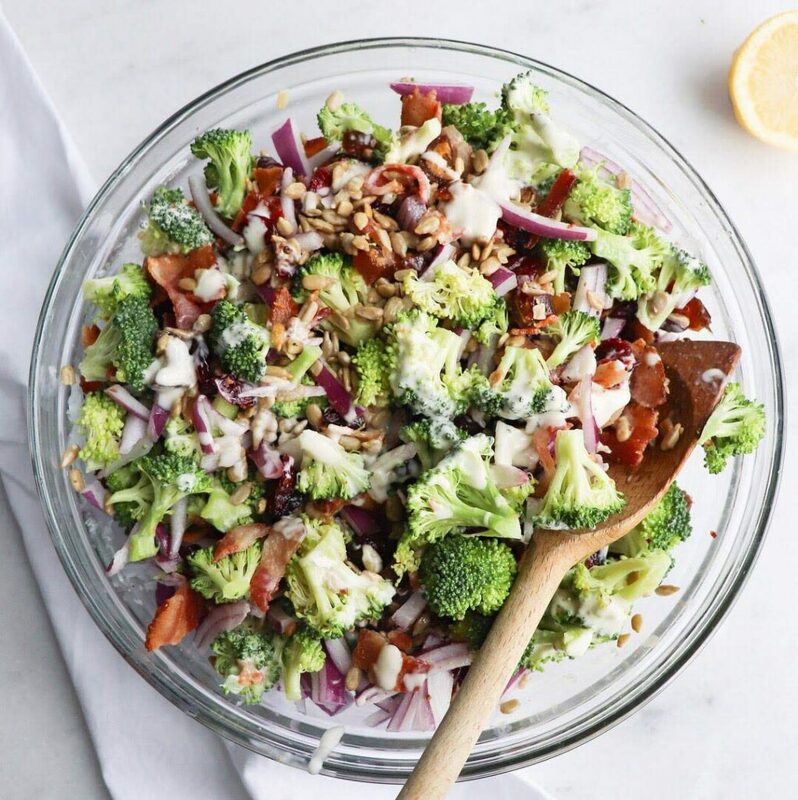 If you like this broccoli and bacon salad, check out some of the other delicious salad recipes on my blog, like this Harvest Grilled Chicken Salad, or this fabulous Zucchini Caprese Salad. This looks so good! I love chopped salads like this. Can’t get enough of ’em!